The greatest thing about educating your children at home is the flexibility it brings. I love that we can choose what time of day we will do school, if we will bring it along in the car, or if we will skip it all together to go on a field trip. The flexibility is wonderful and yet can be a problem too. With all the flexibility I have found I have to be more intentional about our schedule so that we actually do our school work. Here's what has worked for me. My kids are brightest and most ready to work first thing in the morning. So we begin right after breakfast. I schedule any appointments after lunch so that I can be sure we have time to get math and reading accomplished. We do science, history, art and other things after lunch on days we don't have appointments. I have tried schooling all the kids at the same time and I've tried giving them their own one on one time. I prefer doing each child separately. That does not mean the other kids aren't in the room, as sometimes they are sitting at the same table. It just means that during a lesson I am focusing primarily on one child. If I'm doing math with my oldest, the other two can be playing or they can be at the table doing tracing or copy work. This is a great time for file folder games that they already know how to do or other independent work. This way they aren't interrupting the lesson. When I'm doing lessons with my kinder son my oldest will do a read aloud with the youngest or help her with things like shapes or other things that the oldest has already mastered. The key is to make sure each child has one on one time. For my youngest her time is a bit shorter as she doesn't have as much school work she needs to accomplish, but I still give her that one on one time, reading, working on her letters, coloring. 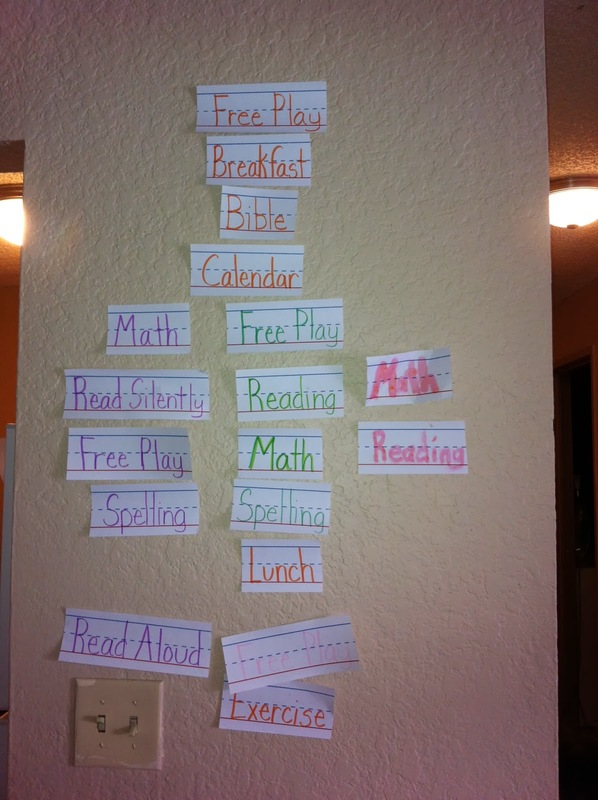 I made a visual schedule for my kids it's attached to the wall with sticky tack and we move it around each day. The part that never changes is the top four. We do those every day together before we move on to anything else. I colored the things we do all together in orange and then color coded each child separately. I had to schedule in exercise, which we like to dance and jump around to praise music as our exercise. We then add on our other subjects if we don't have appointments. We all know that kids thrive on schedule, they need it for a sense of security. So having this schedule has greatly helped them. They know what to expect and there are less behavior problems because of it. The schedule has also helped me. Now I know that my phone needs to be ignored, and emails and blogs postponed until after lunch. It helps me keep focused on my children and teaching them to the best of my ability. What type of schedule do you use? Do you display your schedule? Share with us.